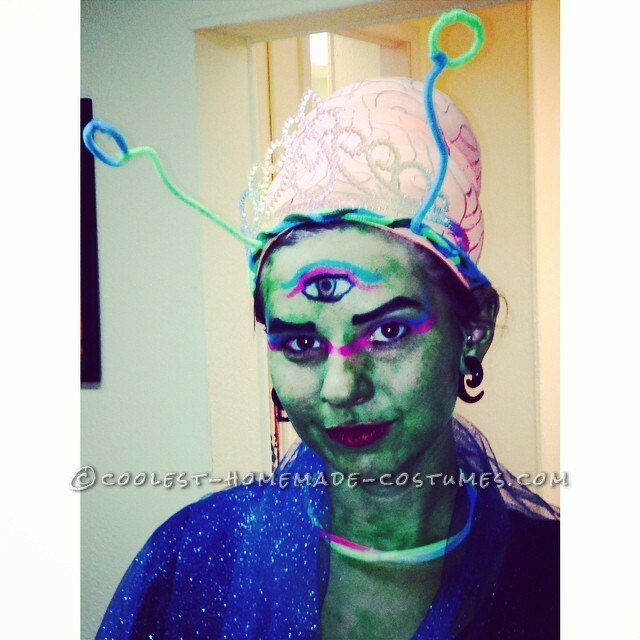 There were many things I thought about being, I jumped from skeleton to circus freak to finally an alien because well I wanted to do something that was out of this world, and painting myself green seemed like a fantastic idea. I started planning what I was going to do 2 days before Halloween. I started with my big over-sized brain. Most of my materials were from home so naturally my creativity muscle was in full force. I tried a few different ideas before settling with a pair of peach tights that were filled with cotton and fabric. I couldn’t get the brain to look right. There was always this little ridge that would form between the cotton and my head resulting in a phallic appearance. I often thought about just dressing up as male genitalia but although I knew it would be hilarious, I wanted to be an alien. The rest of the costume pretty much came together smoothly. I used an old pillow case for a skirt. A friend lent me my sparkly throw. The only things I spent money on were glow sticks and food coloring (for my body paint) totaling at a whoping $4! The skin was a lot of fun to do. I just used lotion and mixed in green food coloring. I was unsure if the color was going to wash off, but I took the risk anyways. It was a success! It did wash off the next morning but left me with some blemishes on my face. It was worth it! I had a friend do my makeup. I think the 3rd eye really pulled everything together. It was a really fun costume. Many people didn’t know what I was but I think it was because they were expecting me to be a specific character.